Following his victory against the Praetor Juventius Thalna, Andriscus conquered the traditional Macedonian territory of Thessaly to the south of Macedon. Rome now sent Quintus Caecilius Metellus with a full consular army. He would have recruited allied Greek troops before moving against Andriscus. Andriscus' popular and financial stock must have been high as he was now able to field enough troops for two armies, but his cavalry general, Telestes, was persuaded to go over to Metellus. Andriscus sent one army into Thessaly to delay the Romans, but Metellus was able to bypass it and then run Andriscus down to battle just north of Pynda. 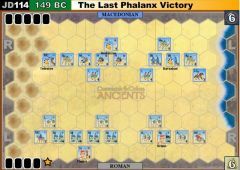 In the subsequent battle the Macedonian army was crushed and Andriscus fled to his haven of Thrace where he raised a new army from among the tribes still loyal to him. But Metellus was relentless and brought him to battle once more, and again the Romans won. The Thracian support for Andriscus now evaporated and he was turned over to the Romans by a Thracian prince. This final defeat of Macedonia led to the formation of the new Roman province of Macedonia that also encompassed Epirus, Thessaly amd parts of Thrace and Illyria. The dream of Alexander the Great and so many others after him was dead. 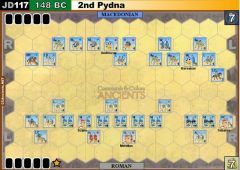 Roman Tactical Flexibility: An unsupported Macedonian heavy infantry unit may only battle back against a Roman medium or heavy infantry unit with 3 battle dice. The 2 Roman medium infantry units marked as "Greek" do not qualify for this rule. Mark these units with a Special Unit marker or use blocks of another colour for them. These units represent Achaean hoplites that don't have the tactical flexibility of the Roman legions.